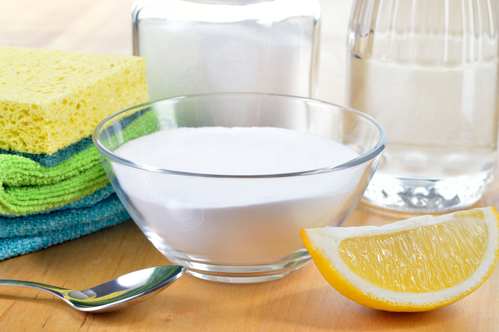 Natural cleaning products are effective, inexpensive, and easy to make in the comfort of your home. For tougher tasks, leading maid service Carmel Indiana pros are there for you. Simply pour all the ingredients into a 16 oz. glass spray bottle, and shake. The ingredients will combine naturally. This is perfect for countertops, as well as other surfaces. The ingredients tend to separate, so always shake before use. And we’re sure you don’t need any help from maid service Carmel Indiana with that. Really simple to make. Combine all the ingredients in a spray bottle, and apply to mirror or glass surfaces, especially Indian mirrors. The solution has to sit for about half a minute, and then you can wipe it with a cloth. This is a good way to clean those hard stains. First, combine water, salt, castile soap and baking soda until a paste forms. After that, use the paste to create a thin layer in the interior of the oven, and let it rest overnight. Clean with warm water and a sponge, giving it a final rinse with vinegar. No more oven residue for you. Just combine all the ingredients in a glass spray bottle and shake. Use it by spraying over your shower and tub whenever you deem necessary. Wipe with a cloth if you want it to shine, or rinse with warm water. Use a small bowl to mix together the salt, baking soda, and tartar cream. Pour half of it in the drain, and then pour some boiling water. Let it do its magic for about an hour. After that, pour some cold water in the drain. This usually does the trick right away, but if not, pour some baking soda and some white vinegar, and let the drain unclog overnight. This one is a bit trickier, but nothing you can’t handle. You can always ask your resident maid service Carmel Indiana for help. Grab about 15 cloth squares and put them in a container. Take water, essential oils, and vinegar, use a bowl to mix them in, and pour in the container with the cloths. Let the cloths soak it all in, and then use them. You can wash them, and reuse them for a new batch. Mix all the ingredients in a glass spray top bottle, shake, and freshen any room up. The scent is excellent, and you can use a different essential oil per your taste. Making and using your self-made natural cleaning products is excellent fun, and everybody should try it out. But there are times when you simply don’t have the energy or the time to do so. For times like those, DeluxeMaid is at your service. We have the best products, staff, and the know-how to make your home shine. Call us.